Properly clean and lubricate your tools after each use. When it comes to digging in the garden or pruning trees and shrubs, having high quality tools that are cleaned, lubricated, sharpened and otherwise properly maintained, makes any outdoor job simpler and more efficient. 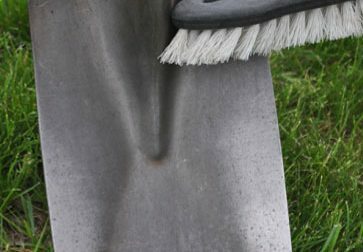 Clean, well-maintained tools take less effort to work the ground than those that are rusted and caked with soil. Sharp tools are especially important for properly cutting grass, pruning tree and shrub branches and even pruning herbaceous ornamentals and houseplants. How do I clean my tools? Always try to clean your tools after each use. Rinse tools under running water or soak them in water. Then remove any remaining soil using a cloth, bristle brush or wire brush. Get rid of any sap that may have collected on cutting tools with soapy water or turpentine. If tools are rusted (whether it be shovels, hoes, saws or pruning shears), use coarse-grade steel wool or lump pumice to remove the rust. Use abrasive materials like sandpaper, emery cloth or a putty knife cautiously as they can leave scratches where rust can redevelop. Disinfest tools by treating them for at least 30 seconds with 10% bleach or preferably 70% alcohol (because of its less corrosive properties). Rubbing alcohol and many spray disinfectants typically contain approximately 70% alcohol. Once tools are clean, rust-free and dry, apply oil, WD-40, silicone spray or some other rust inhibitor to all metal surfaces. How do I sharpen my tools? Start by always wearing safety glasses and leather gloves to protect your eyes, face and hands; also always use a vise to securely clamp tools being sharpened. 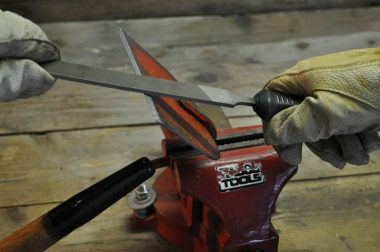 Typically, garden tools should be sharpened so that their cutting edges are kept at their original angle. If you make an edge too blunt, a blade will not cut well. If you make a blade too sharp, the edge will wear prematurely. You can sharpen either into or away from the cutting edge. Sharpening into the edge produces a sharper edge, but increases the risk of cutting yourself as you sharpen. For increased safety, face the sharp edge or your tool away from you and stroke down the slope across the cutting edge. This will create a metal burr (i.e., a rough edge) on the back of the tool’s cutting edge. Remove the burr using a light flat stroke of a file, whetstone, or sandpaper along the back of the cutting edge. 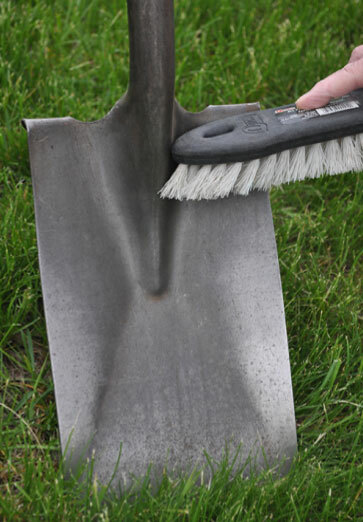 Shovels and hoes: The most commonly used sharpening tool for shovels and hoes is a 10 inch mill file, which can be purchased at any hardware store. Mill files cut only on the forward stroke, so do not apply pressure on the back stroke. To sharpen the edge of the blade, hold the file securely with both hands and push away from your body with long steady strokes. Be sure to hold the file at the same angle as the tool’s original angle. As you push down with the file, also push it to the side and across the blade. Keep doing this until you have a smooth, even edge across the entire blade at the desired angle. After filing is complete, turn the tool over, clamp it back into the vice and remove the metal burr as described above. Note that many inexpensive shovels and hoes are manufactured using a stamping machine, which leaves their cutting edges blunt and square. For these tools, you must first create a new cutting edge. Typically, a 30° angle is recommended. To visualize this angle, remember that the edge of the freshly filed metal will be twice as wide as the metal is thick. Saws: Pruning, camping and bow saws are typically not sharpened, because replacement blades are relatively inexpensive. Typically, chain saws are the only type of saws that are sharpened due to the cost of replacement blades. When sharpening any saw, both a cross-cut file with a rounded edge and triangular file will be needed. Be sure the size of the file matches the size of the teeth being sharpened. Sharpen teeth so that they retain their original angles. Axes: Not all axes have the same blade angle, so it’s important to follow the original angle. Also, many axes have a double tapered angle composed of a ½ to 1 inch long angle that extends roughly 1/16 of an inch from the edge of the blade toward the handle, and a sharper angle, roughly 1/16 of an inch wide at the cutting edge. Inspect the blade for chips or nicks, and remove them with a grinder, being careful not to burn (overheat) the edge. Keep a bucket of water handy to douse the head after each pass. If the blade has only small nicks or irregularities, a 10 inch mill file could be used instead of the grinder. Finish by using a sharpening stone. Slide the stone back and forth in a circular motion multiple times along the edge on one side then repeat on the other side. What other tool maintenance do I need to worry about? Handles are an important component of all tools and need to be kept in good condition. Tighten loose screws or bolts as needed. Clean handles with a stiff-bristle brush, and use medium grit sandpaper to smooth wood and remove splinters. Use boiled linseed oil to prevent wood handles from drying out, cracking, and splintering. Be sure to read and understand the linseed oil label; handled incorrectly, linseed oil soaked material can spontaneously ignite. As an alternative, use a rubber coating spray on wood handles to give them a better grip and to reduce wear and tear. Properly cleaned and sharpened tools take less effort to use than those that are rusty and covered with soil.